Wheel bolts are safety-relevant components and are used to connect wheel and wheel hub. The high-strength connecting elements are available in different versions, according to application. Depending on the form and characteristics of the wheel hub, different wheel bolts are used. To ensure a safe hold, the wheel bolts are countered with matching wheel nuts. Production of wheel bolts is carried out by cold forming. Here, the raw material in the form of wire coils is previously stress-relieved to the required outer diameter. A blank is sheared off from the roll by machine and further processed. Increased strength and improved surface quality is achieved. Wheel bolts of the DT® Spare Parts brand are available in all standard variations. The following examples show wheel bolts in the grinded version, spiral wheel bolts, as well as spiral wheel bolts with environmentally-friendly Geomet coating. In the case of the grinded wheel bolts, a specially formed area on the bolt head ensures security against rotation. A press fitting ensures that the bolt is held securely in the wheel hub. Spiral wheel bolts of the DT® Spare Parts brand have a materialoptimised press fit and are characterised by low wear during assembly. Due to the pressure grouting in the elastic area, bolts and wheel hubs can be re-used even after repeated assembly. A further version of the bolt differs in the surface coating. The Geomet coating enables a constant tightening performance with the first use and after repeated use, as well as optimum protection against corrosion. The use of chrome-free Geomet also conforms to the environmental protection requirements of the EU End-of-Life vehicle directive. 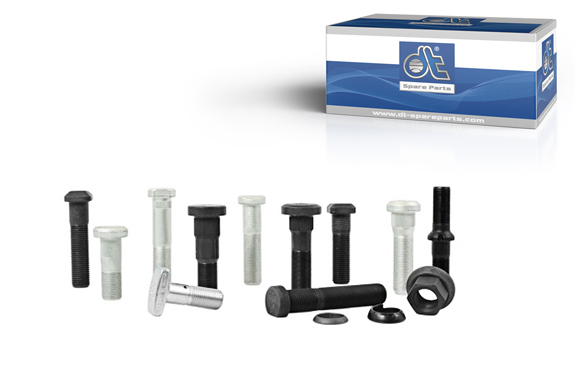 Through the use of high-quality wheel bolts, both the safety and reliability of commercial vehicles is increased. Particularly in the case of safety-relevant parts, installation should be carried out exclusively by trained specialist staff. When replacing the wheel hub, the vehicle manufacturer’s recommended tightening torque, for instance, must be observed. In addition to wheel bolts, DT® Spare Parts offers all standard wheel hubs, wheel nuts, spring rings and washers. All articles required for the replacement of wheel hubs are also available as complete repair kits.